New York: There's a buzz after Mary T. Barra, 51, was named the next chief executive of General Motors on Tuesday, the first female CEO of a "Big Three" American car company - or any major global car maker for that matter. "At long last, Detroit is getting some girl power," noted Forbes.com. Starting from pharmaceuticals to aerospace, women have broken into the C-suite, but the car industry had been a holdout, in Europe and Asia as well as in the US. As the first female CEO of an iconic car company, Barra joins Meg Witman at Hewlett-Packard, Ginni Rometty at IBM, Indra Nooyi at PepsiCo, Marissa Mayer at Yahoo! Inc., and Ursula Burns of Xerox as women who have risen to run Fortune 500 companies. Still, when Barra takes over on 15 January, just 23 of the Fortune 500 companies will have female CEOs. Barra beat out Mark Reuss, president of GM North America, another longtime company exec to become Dan Akerson's successor. Akerson, who is leaving GM to look after his cancer-afflicted wife, had envisioned a woman one day running one of the large Detroit auto makers. "The Detroit Three are all run by non-car guys," outgoing CEO Akerson said in September in Detroit. "Someday, there will be a Detroit Three that's run by a car gal." That's Barra. After a long run of CEOs with financial backgrounds, General Motors is once again choosing a car-savvy engineer for its top role. Barra, is from the automotive side of the business and has an electrical engineering degree from General Motors Institute at Kettering University. In 1988, a GM fellowship took Barra to Stanford to earn an MBA. She went on to rise through the management ranks, running engineering divisions and managing a car assembly plant. ''There's nobody with more years of honest 'car-guy' credentials than she has," Erik Gordon, a professor at the Ross School of Business, said about Barra, the daughter of a die-maker in the auto industry, to Associated Press. Akerson said Barra's ability to bring order to chaos in product strategy helped make her the "right choice" to lead America's largest auto maker with $152 billion in sales last year. Barra is currently the head of global product development. She is in charge of engineering, design and quality control for all GM's cars. Her prospects increased as several car designs, such as the Chevrolet Cruze and Impala, proved hits with customers. Reports noted that Barra had rightly argued that GM should take a risk and make the Cruze more sumptuous as customers are willing to pay extra for a nicer car. With the bells-and-whistles, the Cruze became a top-selling compact car. "Many critics of the 'old GM' have long noted that old GM was run by finance types, with engineering relegated to a second-tier status. The management changes GM announced this morning flip that paradigm. We see the announcement as a positive, as it marks the first time in a very long time that GM is being run by an engineer, Mary Barra," said Barclays analyst Brian A. Johnson. "The focus on effective product development and engineering processes will become more prevalent within GM with Barra's promotion, and will be part of the company's evolution and ongoing improvement. Indeed, we see Barra as more of a 'process architect' than a 'car guy (or gal)' - not a bad thing considering the success of Alan Mullaly in that role at Ford, or the original success of Alfred Sloan at GM in the 1920's-50's." Loyalty to a single employer is now the exception rather than the rule. But Barra astonishingly is a GM lifer. Her 33 year career started when she was only 18 as a student at what was then known as General Motors Institute - now Kettering University. Barra is a second-generation GM employee; her father was a die maker at now shuttered Pontiac for 39 years. Barra also started her career as an engineer at Pontiac, then went off to Stanford for an MBA on a GM scholarship and came back to Detroit in 1990. She's been with GM ever since. The executive realignment at General Motors comes a day after the US Treasury sold its remaining GM shares, ending government involvement in America's largest auto maker. The US Treasury received a stake in GM after providing it with a $50 billion financial bailout. GM has made about $26 billion in profit over the past 15 quarters. Still, the automaker is nowhere near as profitable as global competitors such as Toyota and Volkswagen. GM's operations are much more complex and expensive than those of its major rivals, according to Adam Jonas, an analyst with Morgan Stanley. 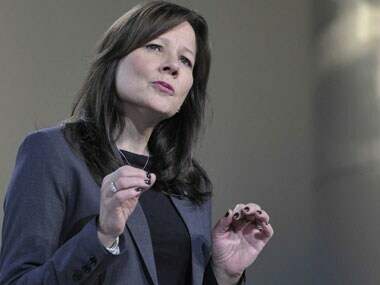 "She (Barra) has streamlined management in GM's vehicle engineering units, cutting to one from three the number of executives overseeing a vehicle program, and challenged designers and suppliers to reduce unique components," said The Wall Street Journal. Akerson in a conference call on Tuesday defended his product chief's record. "Mary went into an organization that, quite frankly, four years ago, was in chaos and brought order and started to fundamentally transform how we do product development," Akerson said. "She grew up in the company, worked on the factory floor, managed plants and then managed the largest most-complex segment of our business." "The first vehicles designed and engineered fully on her watch are just starting to appear. Mr. Akerson and GM's board clearly like what they see. The real test will be whether consumers around the world share their enthusiasm," said the Journal.